Eyjafjallajökull is Iceland's famous volcano with the long name that can be very difficult to pronounce. It is located near the south shore between Mt. Hekla and Mt. Katla, two active volcanoes. Also an active volcano, Eyjafjallajökull is completely covered in an ice cap that feeds to several outlet glaciers. At its highest point, the volcano stands 5,417 feet tall, and the ice cap covers nearly 40 square miles. The crater is about two miles in diameter, is open to the north, and has three peeks along the crater rim. 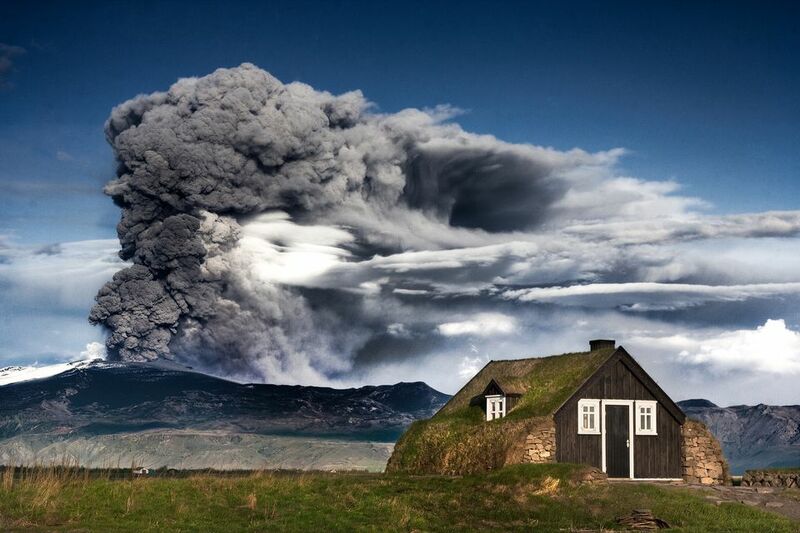 Eyjafjallajökull has erupted frequently, the most recent activity being in 2010. The name Eyjafjallajökull may sound complicated, but its meaning is very simple and can be broken down into three parts: "Eyja" means island, "fjalla" means mountains, and "jökull" which means glacier. So when put together Eyjafjallajökull means "glacier on island mountains." Although the translation isn't that challenging, pronouncing the name of this volcano is—Icelandic can be a very difficult language to master. But by repeating the syllables of the word, it should take you just a few minutes to pronounce Eyjafjallajökull better than most. Say AY-yah-fyad-layer-kuh-tel to learn the syllables of "Eyjafjallajökull" and repeat several times until you've got it down. Whether you were privy or not to the news reports on Eyjafjallajökull's activity between March and August of 2010, it is easy to imagine the foreign news reporters mispronouncing the Icelandic volcano's name. But no matter how it was pronounced, the story was the same—after being dormant for more than 180 years, Eyjafjallajökull began emitting molten lava into an uninhabited area of southwest Iceland, thankfully. After roughly a month of inactivity, the volcano erupted again, this time from the center of the glacier causing a flood and requiring the evacuation of 800 people. This eruption also spread ash into the atmosphere causing air-travel disruption for nearly a week in northwest Europe, where 20 countries had closed their airspace to commercial jet traffic, affecting nearly 10 million travelers—the largest air travel disruption since WWII. The ash continued to be a problem in the airspace for the next month, continuing to interfere with flight schedules. Toward the beginning of June, another crater opening was formed and began spewing small quantities of volcanic ash. Eyjafjallajökull was monitored for the next few months and by August was considered dormant. The previous volcanic eruptions of Eyjafjallajökull were in the years 920, 1612, 1821 and 1823.